GREENVILLE — East Carolina saved its best for last as the Pirates held Charlotte scoreless for the final 6:41 to top the 49ers 54-51 in the final regular season Conference USA matchup between the two state rivals. ECU was 0-7 against the 49ers in previous C-USA meetings. Pirates fans among a Saturday afternoon crowd of 5,316 in Williams Arena at Minges Coliseum stormed the floor and Coach Bill Herrion pumped his fist in triumph during the postgame celebration. Moussa Badiane had 16 points, nine rebounds and his three blocked shots moved him past former Cincinnati star Kenyon Martin to become the career C-USA blocked shots leader with 294. Badiane blocked a close range attempt by 49er preseason All-America Curtis Withers with 42 seconds left to preserve a 52-51 ECU lead provided by a 15-foot jumper from freshman Tom Hammonds with 1:06 remaining. Hammonds hit 6 of 8 from the field and all four of his free throws for 16 points. Badiane made another huge defensive play with 5.8 seconds to go when he took a charge in the lane on Charlotte's Eddie Basden with ECU still holding a 1-point advantage. "I was thinking about blocking the shot," Badiane said. "I saw (Basden) going through the lane and I just wanted to make a play." Mike Cook, who had 10 points, made both ends of a one-and-one with 4.3 seconds left to push the lead to 54-51. Withers had 23 points and 13 rebounds but ECU did a better job of limiting his inside production after going to a box and one with Japhet McNeil shadowing Charlotte sharpshooter Brendan Plavich. 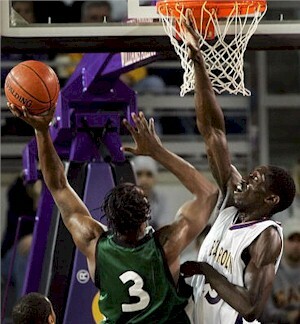 "George Stackhouse (ECU assistant) suggested the box and one, and I don't think we've ever practiced it," Herrion said. "But what it did was help keep Withers from getting the ball." Withers had Charlotte's last points when his 3-point play with 6:41 left gave the 49ers a 51-44 lead. With 6:20 to go, Charlotte's Mitchell Baldwin was called for an intentional foul and Badiane dropped two free throws to get ECU within 51-46. Badiane's bucket with 5:33 showing cut the margin to 51-48 and Cook got the lead down to 51-50 with 4:15 remaining. ECU limited the 49ers to 32.1 percent field goal shooting and held a 45-37 advantage on the boards as Corey Rouse, the league's leading rebounder, grabbed 11. ECU (7-13, 2-6 C-USA) will take the momentum of a 2-game wining streak to Memphis for an 8 p.m. tip-off on Wednesday. Charlotte fell to 14-4 overall and 5-2 in the league. "This helps us in our effort to make the Conference USA Tournament," Herrion said. The 49ers have won at Valparaiso, Davidson, Indiana, UAB and Marquette but couldn't hold on for a road win at ECU. "I knew East Carolina would beat someone near the top in here," said Charlotte coach Bobby Lutz.